Keyless Convenience - No keys needed, no worry about losing keys. 4-digit combination padlock makes life easier, you will no longer have troubles locking yourself outside your house, when you go out for sports, don't need to take your keys. Durable Zinc Alloy casing and ultra-strong steel , they're ideal tools to keep the thieves far away from your belongings. Weatherproof materail makes the lock perfect for outdoor and indoor use. Combination locks are popularly used in school, home, office, gym, ideal for gates, gym lockers, employee lockers, sports lockers, fences, toolboxes, cases, hasp storage, suitcases, luggage, etc. 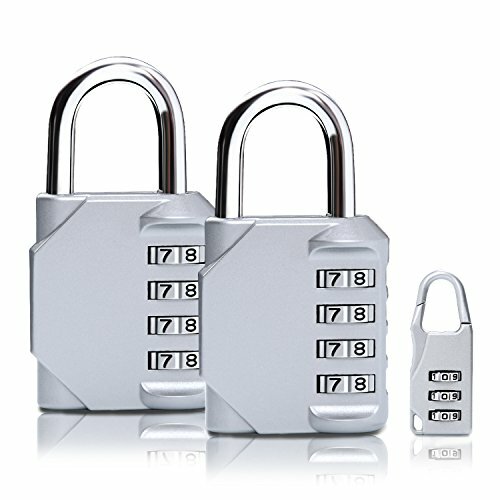 3 pack : Set includes 2 zinc alloy 4-digit re-settable combination travel locks. Secure Bags & Lockers Perfectly : ORIA combination lock has 4-digit, offers 10000 combinations, which is more difficult to crack than the 3 digit locks, which cannot be removed by human force. Excellent Design : Small volume, light weigh, fit through the holes of a lot of suitcases. Widely Uses : These locks design for indoor and outdoor use, ideal for most light-duty tasks such as Gym/Sports, school & employee lockers, cabinets, cases, hasps and general storage. The lock is sleek and easily fits through the holes of your luggage zipper pulls. Easy to Use : Setting or re-setting your own combination is simple and straight forward. The combo side window helps you to set the combination more clearly. If you have any questions about this product by TTRWIN, contact us by completing and submitting the form below. If you are looking for a specif part number, please include it with your message.